November 5, 2015 November 6, 2015 / Elizabeth T.
As with every month’s end, I’ve rounded up some of my favorites, so I hope you’ll enjoy! Following up on the topic of nails, another favorite of mine this month is definitely the Burt’s Bee Lemon Butter Cuticle Creme Lemon. Though I love painting my nails, having nail color on all the time can leave nails and the skin around the nails feeling a little dry, fragile, or even broken. This is why I try to let my nails rest for at least a day or two in between nail polish application, and during this downtime, I generously apply lots of hand cream, but I always notice that the skin around my nails tend to still be a little dry despite everything that I use. 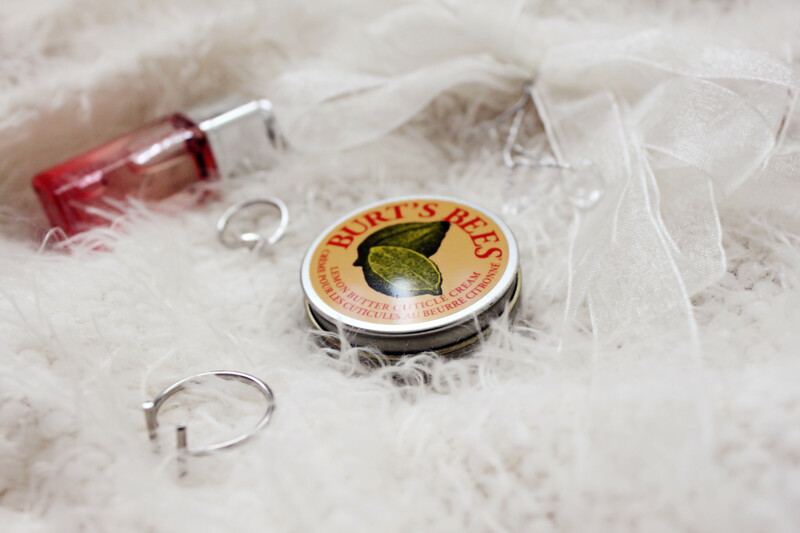 After trying Burt’s Bee, though, I can definitely feel a difference – the broken skin around my nails heal so fast, and it’s left feeling so soft! 🙂 I also love the lemony, fresh scent of it! As many of you know, I’ve been suffering from a mild allergic reaction for the past two months, but I’m almost all healed now, and I can’t thank my Clarisonic Mia 2 enough! I’ve had my Clarisonic for a while now (almost two years), but I would use it on and off in the past, never really committing to it despite all of the great reviews that I’ve heard (mainly because I’m lazy). However, due to all of the multiple breakouts that I’ve been having recently, I turned back to it, using this cleaning device religiously, and I definitely see an improvement in my skin! 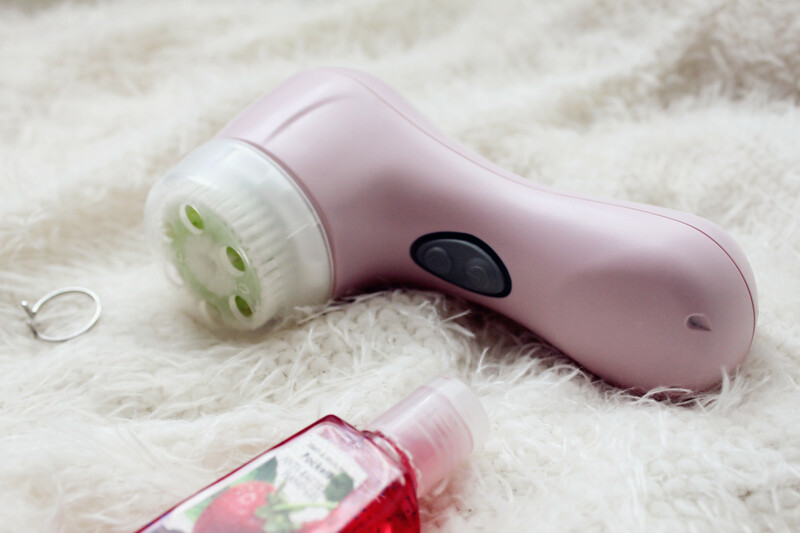 🙂 I know that some of you think using a cleaning device on already reactive skin might be a little too harsh, but I made sure to set it to the lower speed, and I also paired it with the Acne Cleansing Brush Head for the gentlest cleaning experience. I’ve really seen such a drastic improvement in my skin, and I know that I’m going to be regularly using the Clarisonic even after my skin is all healed! With the holidays coming up, Victoria’s Secret has been pushing out a lot of the holiday editions of their fragrances, and every year, I’m never able to resist the pretty packaging and gorgeous bottles! This year is no different, as I couldn’t help but pick up the Victoria’s Secret Victoria Eau de Parfum Rollerball, which is a fruity floral blend of red berries, Victoria rose, and creme brulee 🙂 I love how this rollerball is so travel-friendly and is something that I can stash in my purse or clutch for touch ups throughout the day, something I’ll definitely need during the holiday season for parties and social gatherings. And that completes my favorites for October! Sorry that it’s a few days late! I was out of town on a mini trip to Las Vegas (it’s a four hour drive away from where I live, so it’s pretty close), and I’ve just returned a few days ago 🙂 I’m in the process of editing some of the pictures from the trip (though there weren’t a lot of great ones due to the weather conditions), but I’ll definitely be sharing those soon! How did you all enjoy October, the month of all things pumpkin and Halloween? Are you all as excited about Thanksgiving and Christmas as I am? 🙂 Let me know in the comments! Great post!! Love your favorites!! Happy November!! Great beauty favourites! They’re all so useful! Thank you Carine! 😀 Have a great weekend! Thank you Melanie! And yes, that cuticle cream has been my lifesaver recently ❤ 🙂 Have a great weekend, love! the victorias secret packaging really is adorable! I’ve been wanting to try out the Clairsonic Mia for ages, but I’m not sure that I would be able to commit to it either. I love the color you got though, and it sounds like it’s really worth the money. Also that Nature Republic nail polish is so gorgeous! I love colors that are darker, but still feminine. I was a little hesitant about it at first too, but at the end of the day, it’s always good to have one in your bathroom, just in case you ever need it 🙂 It’s definitely a very useful investment. And yes! That’s been my go-to nail color for the past few weeks ❤ Thank you so much for stopping by, Angelina! the second maze runner movie was so exciting, i kept getting scared by the zombies haha! i haven’t read the book, but i will def give it a go! great picks Elizabeth! 🙂 and i can’t wait for you to share your photos from Vegas. I have the Burt’s bees cuticle cream too and love it. Hope you enjoy your trip to Las Vegas. I can’t wait for the holiday season to come too! Yes, it’s an absolute lifesaver 🙂 And thank you so much Shirlyn! I can’t wait for the holidays too! Oucccch, I hope your allergic breakout is better now Elizabeth! I get that often when the weather changes, or when it goes to severe at one end. How’s Maze Runner? I love Min-Ho, from the movie for sure ❤ Wonder how's the book? Did you watch the Scorch Trial?? Yes, it’s a lot better now, Tiff 🙂 I’ve been trying to take care of it and not irritate it, so it’s been healing really well. And I love the movie so much (probably even more than the books) ❤ I watched the second movie 🙂 Did you? Cutest things, I need the Clarisonic so bad!!! Thank you Marta 🙂 You should definitely get the Clarisonic for Christmas ❤ It's such a great investment! Thanks for your insights on these wonderful products. Happy November! 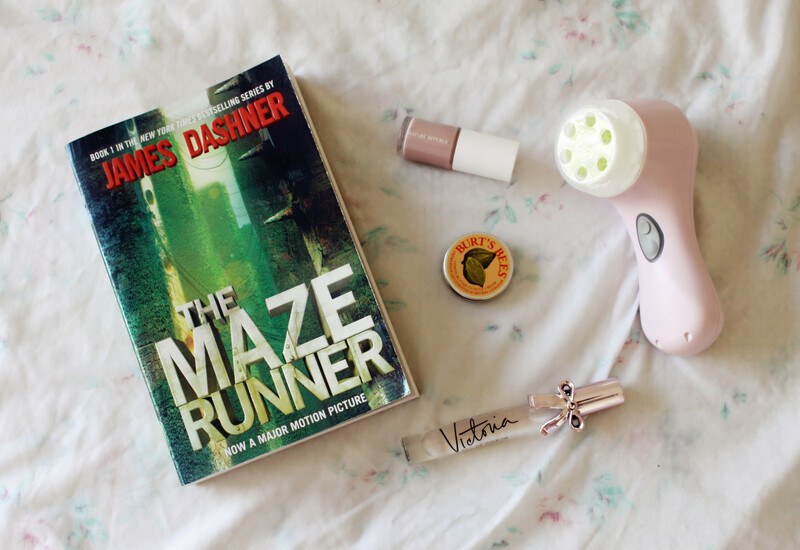 The maze runner is on my list of “must read’s” …. Great post. It’s a really enjoyable read, Ashleigh 🙂 Thank you so much for stopping by! Great list! I have a Clarisonic too, and I love it! I love my Mia! I recently bought mine (in purple!) and so far loving it! Haha the Mia is a must-have in my skincare routine 🙂 Glad to hear that you’re liking it too ❤ Thank you so much for stopping by Dara! Beautiful faves!! Love Burt’s Bees and Mia!! This is so cute. Love the perfume and Clarisonic. Loved your faves a lot, babe. I also have a problem of walking past VS perfumes lol. Thank you so much for stopping by, Nadia!